There’s nothing like a bit of bragging to get my attention. Anywhere that boldly claims to have “the best burger in the world” deserves a visit. 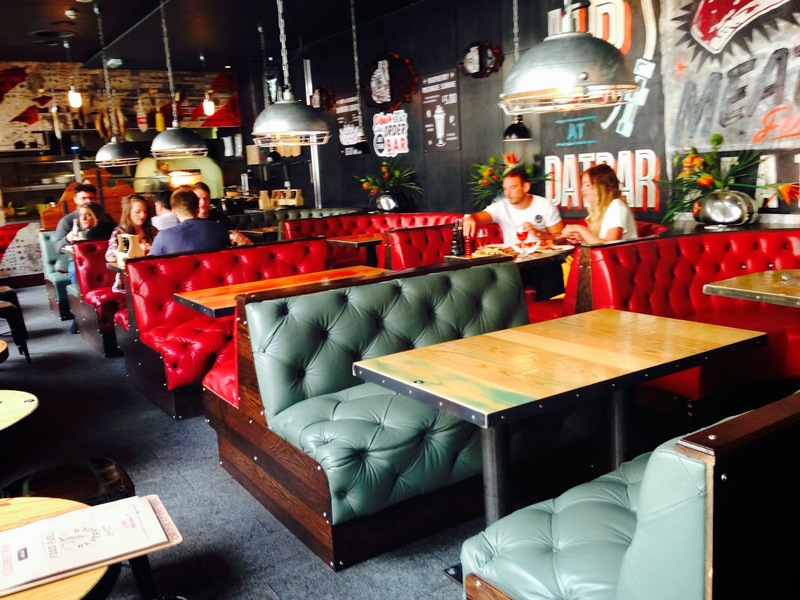 That’s what ‘dAtbAr’ (that’s how they write it) asserts on its Twitter and Facebook pages: the best burger in the world, with a cool, punky, urban vibe. Now forgive me for spoiling their party, but whoever wrote this nonsense clearly doesn’t get out much. The best burger in the world, in my not-terribly-humble opinion, is to be found in DB Bistro on West 44th Street in New York. It’s made with prime sirloin and it contains braised short ribs, foie gras and black truffle, on a parmesan bun. The foie gras comes as a nugget of surprise in the middle of the biggest, most succulently aromatic creation you’ll ever try. It is famous the world over, and currently costs $33 including fries, which, at the present rate of exchange, is a bargain £20. Running DB a close second, and more down to earth, is the burger at Father’s Office, a tiny bar in Santa Monica, California which has queues round the block for its Office Burger, with dry-aged beef and caramelised onions, mix of Gruyère and Maytag blue cheese, applewood smoked bacon and rocket on a soft French roll. In short, dAtbAr should know that it has some competition on the “best burger in the world” front. 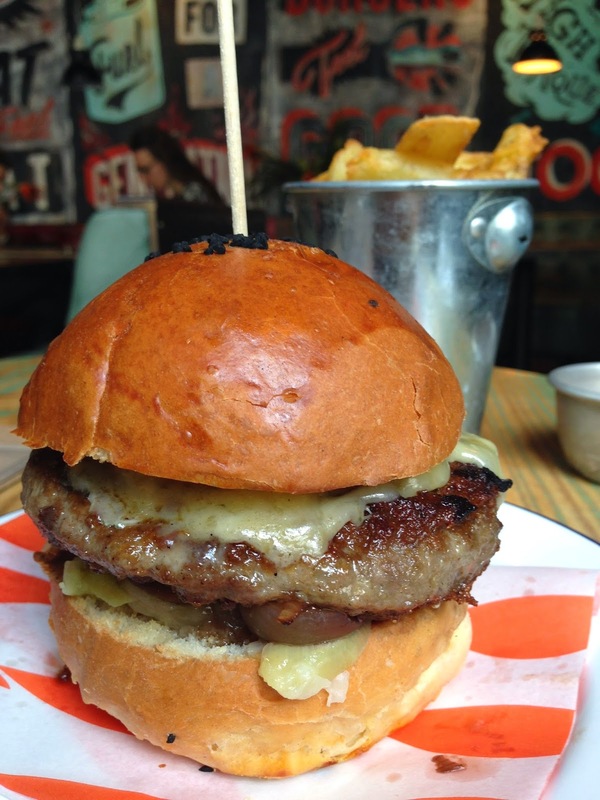 But is it even the best burger in Newcastle? Well, the answer is, probably not. It did get one thing right in the billing: the vibe is cool, punky and urban. 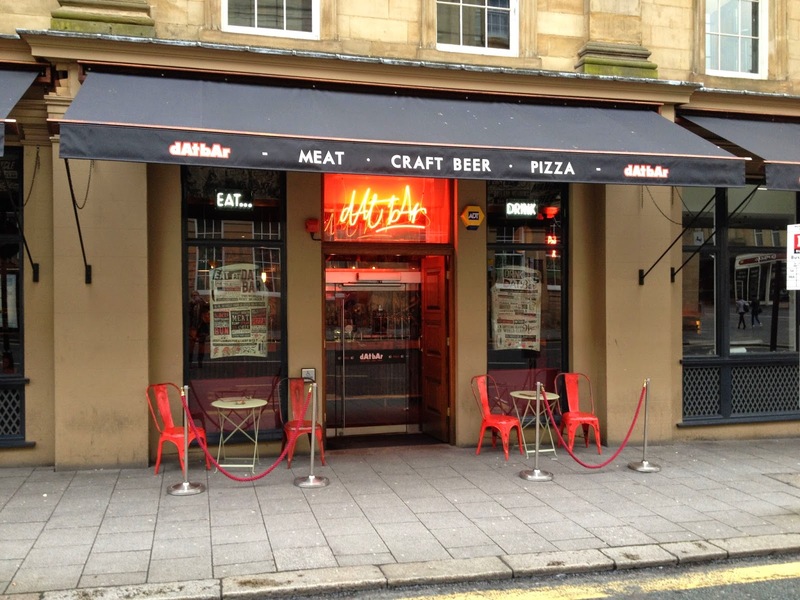 It’s right next to the Theatre Royal in Market Street (in what used to be the theatre’s bar, and more recently the underwhelming Pasqualinos), and has an obsessively large list of beers. It looks like an American diner, with an open kitchen at one end, and a quirky, arty interior which lends it a relaxed, creative ambience. Except, unlike a proper diner, you have to order at the bar. That’s a real shame. When they brought us our food, and we asked the waiter for another glass of red wine, we were told to go back and queue. We knew that by the time I returned, our food would have been cold, so we gave it a miss. This is doing the place a dis-service, literally. What’s strange about this bar is that, even though the food is playing second fiddle to the beers, someone has actually put a bit of thought into it. I guess that’s the influence of the diGeorgio family who own the place. They’ve been behind a lot of successful Newcastle establishments, including Popolo, and I still miss their excellent Puglian food at Secco, which closed a few years ago. So, instead of ordinary burgers and pizzas, which I’m sure would have adequately performed the alcohol-soaking task, they’re offering food on a higher level. They prepare their charcuterie using a vintage Berkel slicing machine (I’m not sure it affects the flavour much, but it’s probably fun to use), their pizza crust is made with sourdough, and they source their burgers from Peter Hannan. This is particularly interesting. In a region with some of England’s finest beef, they get their patties from Northern Ireland. Hannan Meats supplies a lot of gourmet restaurants, because they age their beef inside a 12-foot high vault of Himalayan Salt bricks. I’m not making this stuff up. The salt gives a sweetness and intensity of flavour that makes 28-day old meat taste like it’s been hanging around for 5 or six weeks. It’s uniquely pongy. Burgers made with sirloin are quite fatty, and so need a little cooking to caramelise. I ordered my ‘9 Burger’ medium-rare. Mine arrived very rare indeed. Which meant that the whiff of old cow was quite pronounced. It came in a brioche bun from Matthew Rawlings’ Northumberland Bread Company, which was disappointingly dry. The whole point of brioche is to have butter that melts in the mouth. The burger came armed with Montgomery cheese, baby leeks, onion compote and pickled borettane onions – three types of allium, which is two too many. There was a relentlessly sweet imbalance to the flavouring, despite the sharpness of the cheese. The beef dripping fries were fabulous. Sorry, guys, it isn’t the best burger in the world, or even in town. But, properly cooked on a moister bun, with more varied fillings, it could run Lane7 a close second. They certainly made up for it with the pizza. 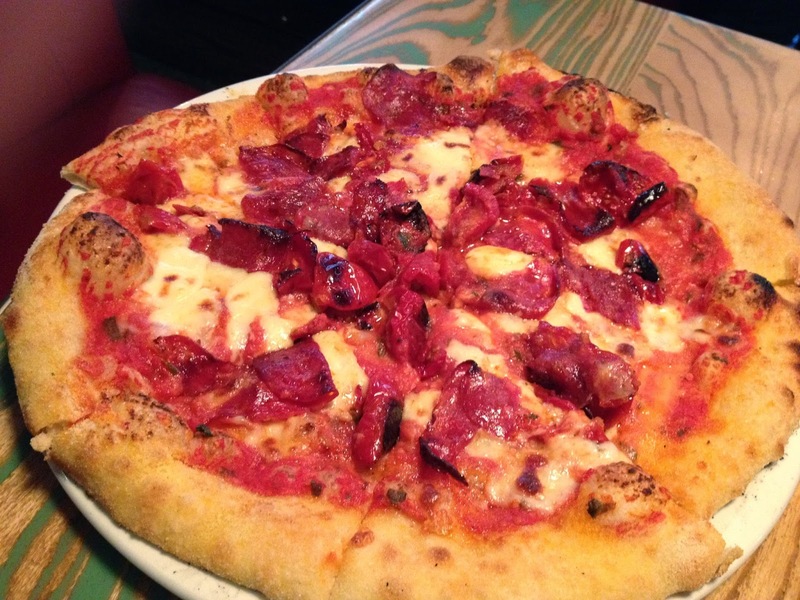 The slow-risen sourdough crust has a fantastic fermented quality, and the toppings (we had the ‘Tallulah Mae’, with spicy sausage and semi-dried baby plum tomatoes) were generous and delicious. We also enjoyed, for no reason other than gluttony, a pulled pork slider, and some cauliflower and artichoke fritters, which were cooked in a crisp tempura-style batter and served with quality aïoli. If this place got some service for its dining area, it would be a very good eatery. And, with more effort on the fillings, it might build itself a reputation for perhaps not the best burger in the world, but certainly the best one close to the Theatre Royal. We had table service when we were in today, so I wonder if it depends on day/time? I would agree with the 1 star for service.Went here a couple of days ago and it took 20 minutes to get my order taken.Blonde waitress seemed to have selective deafness and blindness every time I tried to ask to order. I think the pizza and food at Dat bar is top notch. I'm a little confused about the use of the term sourdough pizza though. It states on the menu that they use 'live' or fresh yeast and they rise for 2 to 3 days. Although lengthy rise times will give similar results to using a natural culture, it is not a sourdough but a fresh dough (made with yeast). Artisans take a lot of time and effort to keep their cultures going and I wouldn't want these guys and girls being disheartened. I think it's harsh to moan about the service and them taking a while to come to the table when it says quite clearly both on the menus and on the walls that you order at the bar. It is quite casual not a posh meal out so I don't see the problem with that to be honest. I would agree about calling them the best burgers in the world but the beers, the pizzas and the risotto balls are damn good. When my partner and I visited; the place stank of a urine clorine smell and I received a knife with encrusted food all over it. Not a pleasant experience. Some things have changed. You can now order from the table and they are swift and friendly. Regarding food, I never actually had a burger in there, but their pizza and fries are really good. Their home made sauce is fantastic by the way. For burgers - byron or five guys, depending what kind of setting you are after. Though, both of them lack the beverage choice that datbar offers... so... yeah... tough call.